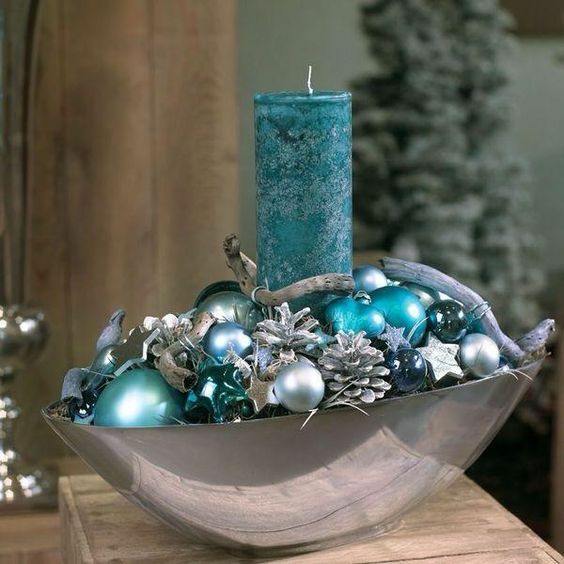 Adding a Christmas centerpiece to your festive dinner table instantly makes it look refined, complete, and beautiful. 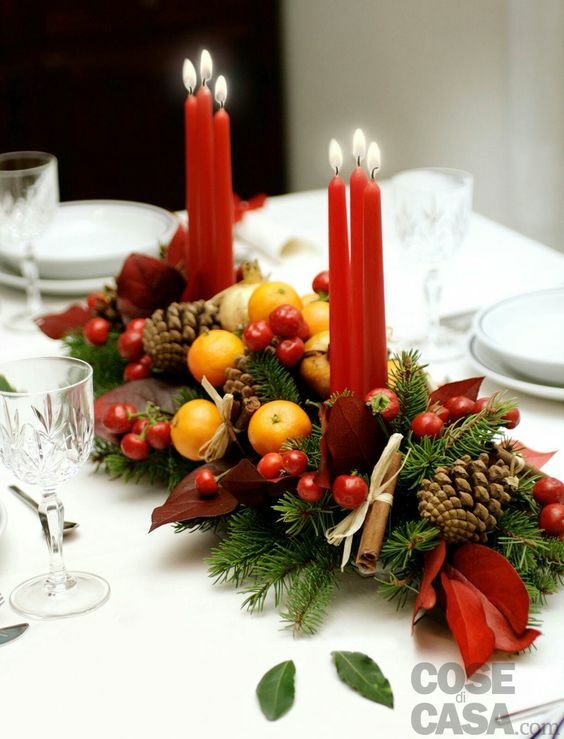 Floral centerpieces are the most used one, however, the Christmas candle decorations bring a magical spark to the table and also could save you tons of money. Candles look whimsical and dreamy, especially surrounded by a wreath of flowers or a bunch of shimmering Christmas ornaments. From gliding candle centerpieces with candles resting in water to minimalistic centerpieces with a few candles and sprigs of greenery to easy DIY candle centerpieces, these Christmas candle table decorations will brighten your table in the best light. 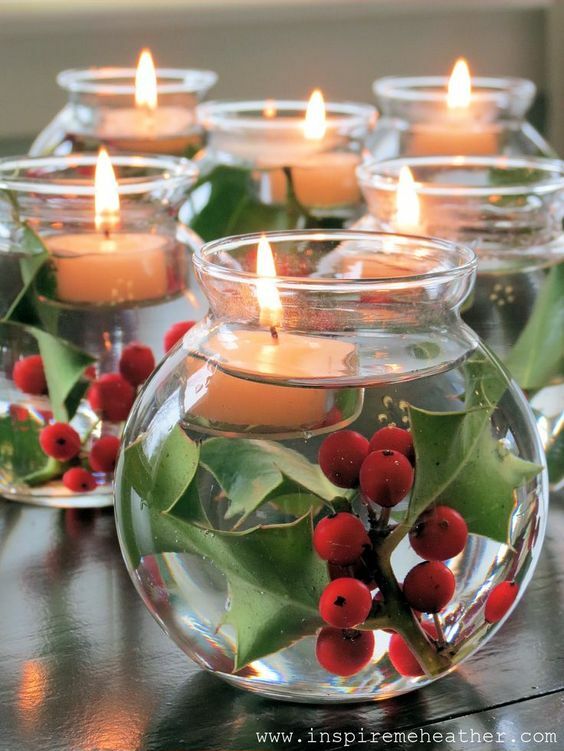 To help you get inspired, here are 24 magical Christmas candle centerpiece ideas. This simple handmade Christmas wreath of a coniferous mix with its cream-white candles is the best addition to your holiday decor. The sparkling baubles and glass-star in an elegant gold frame decorative gold-colored metal strip give this setting a cheerful look. 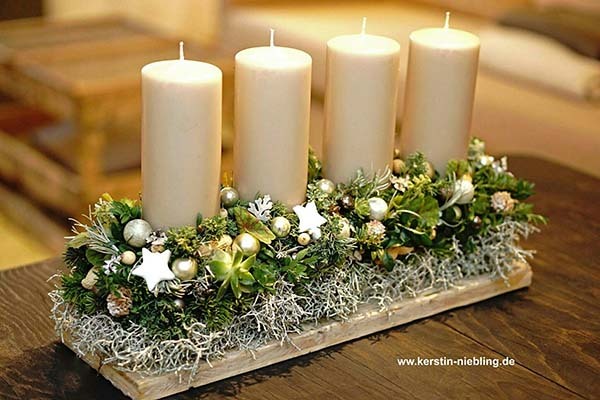 The best Christmas candle holder decorations are usually the ones that look simple yet elegant. 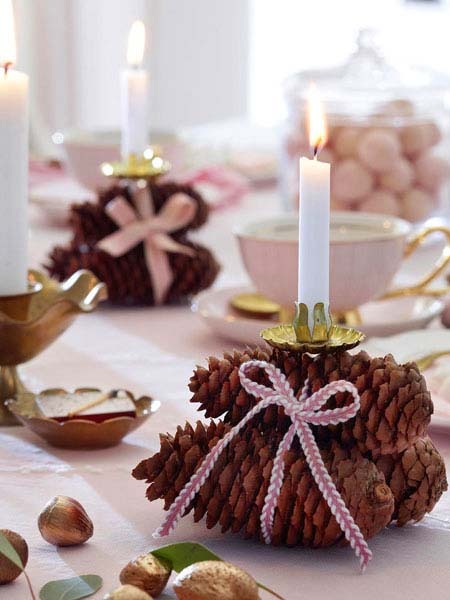 This one, for instance, combines the organic element – the pinecones, which symbolize the nature, and the showy Christmas decorations – the tiny golden candleholder and the cute ribbons. I just love it! 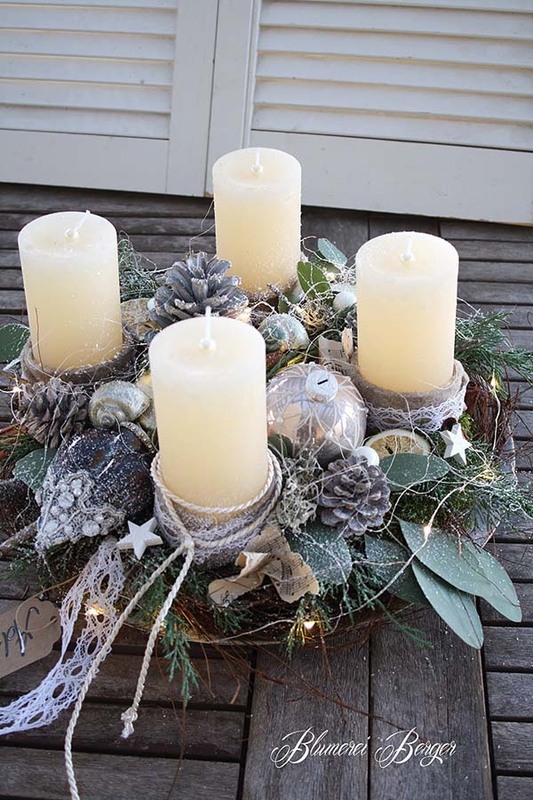 If you want to give your Christmas candle holders decorations an earthy look, go for a moss wreath as a base and combine it with a bunch of florals (could be faux flowers). 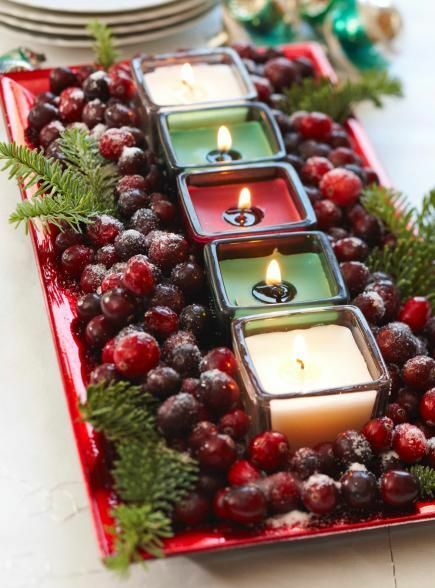 This one is surely one of the easiest Christmas candle decorations ideas to make. In fact, you can use whatever you decide and you can customize the arrangement according to your personal taste. This stunning DIY advent Christmas wreath (on the picture above) is decorated with wooden snowflakes, silver cones, frosted fir, silver dipped balls and a bunch of lace pieces. 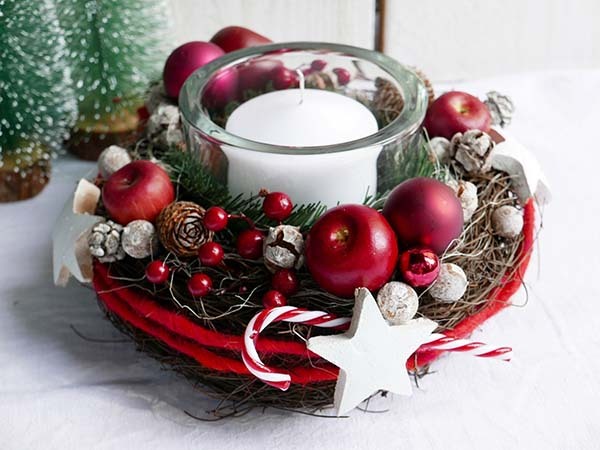 Most of the people think that making a great candle centerpiece is an easy task. It probably is, however, you should consider a bunch of things – it shouldn’t be too heavy and take up too much of the festive dinner table and it needs to be fitting within the theme without going overboard. Moreover, the candle powered Christmas decorations should not be too tall because guests need to see each other. Careful select a color that match with your other decorations – for example turquoise. 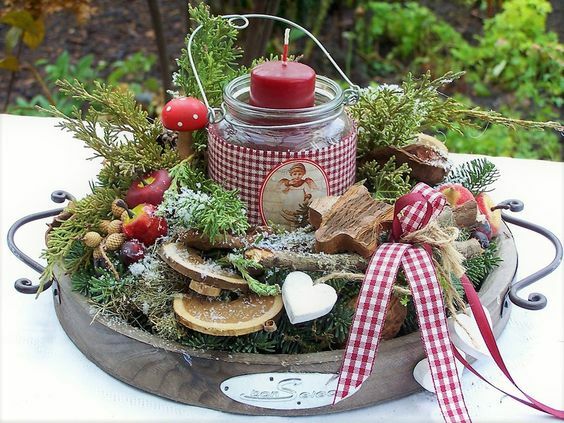 This whimsical candle centerpiece has the right amount of everything. Plus, it will catch everyone’s eyes! 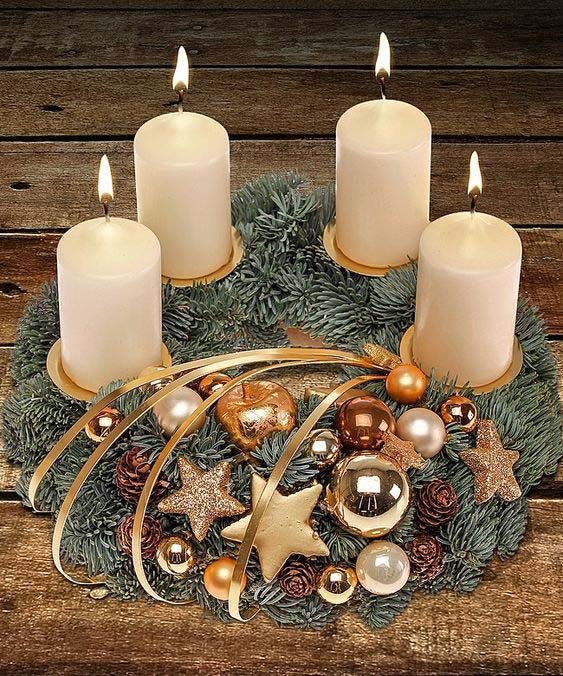 Here is a classic candle centerpiece to display this year. To start, it has all the elements that symbolize the Christmas holiday – candy canes, cranberries, greenery, stars, and some shimmering ornaments. Besides, it is very small in size and still makes a strong statement. I like it! 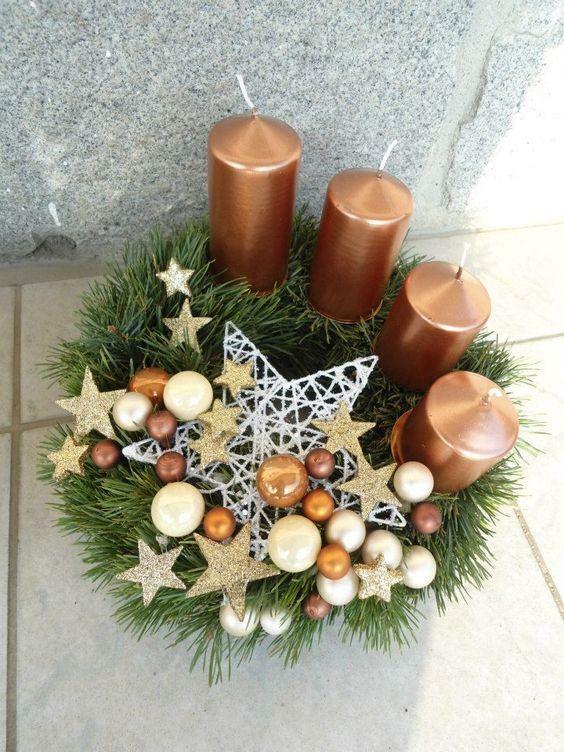 Here is a prompt and simple way to make a stunning centerpiece for your Christmas dinner table. All you need is a faux wreath of evergreens, a few golden pillar candles, and some sparkly Christmas tree ornaments of your choice. I love the contrast between the golden shimmering elements and the organic-looking faux greenery. 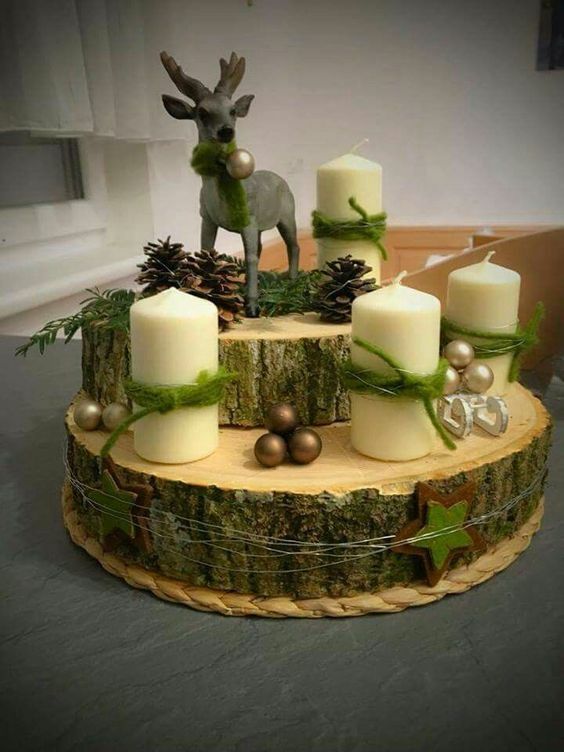 A small deer stands on top of a stump, surrounded by pinecones, evergreens and some Christmas candle decorations. Isn’t it adorable? 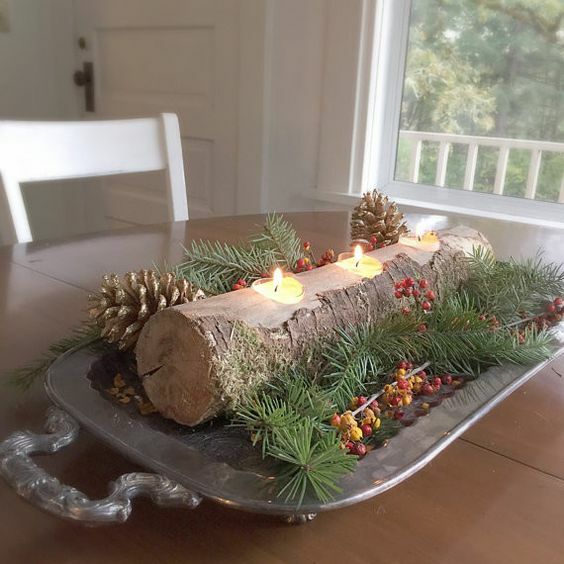 This vintage handmade glass candle holder not only creates a focal point in every festive dining table but can also be easily used during the rest of the year as an everyday table decor. When I showed it to my sister, she said it is too much, however, I love every single thing about it. This Christmas table centerpiece is very dreamlike and quite different than the Christmas candle table decorations I’ve shown you so far. The metallic elements bring a lot of glamour and texture to the dinner table. Besides, keep in mind it is more suitable for a large table. I guess that one of the reasons why people love the Christmas candle decorations is because they are ideal to light up the mood in the festive night. This beautiful, unpretentious table setting, for instance, gives additional warmth thanks to the organic elements and the simple design. 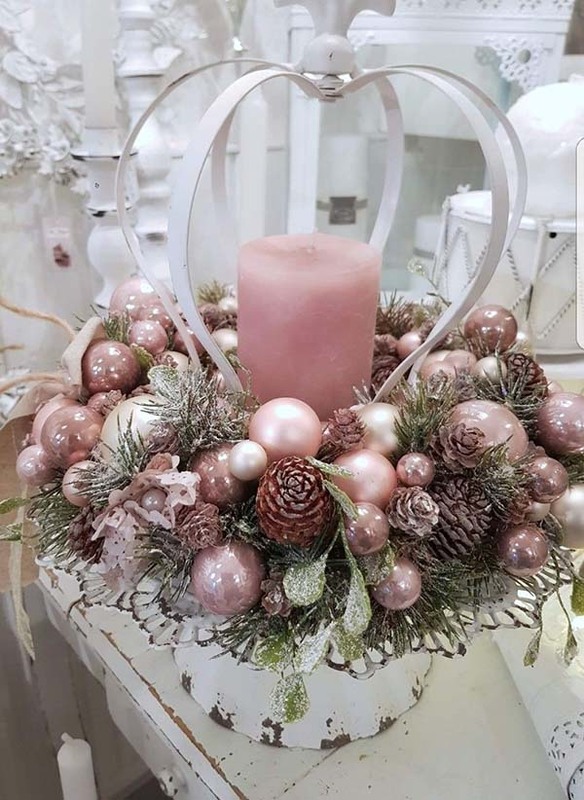 Do you like this stunning vintage Christmas candle centerpiece with pink pastel ornaments, a large pink candle, and some faux frosted evergreens. The whole setting stands on an ivory aged cake stand but you can customize according to the height you want to give this tablescape. 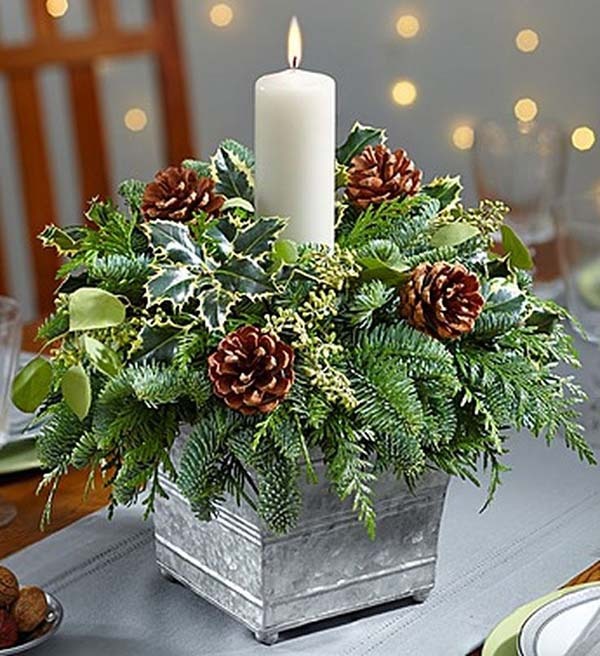 On the festive dining table, you can just pair loose sprigs of greenery (in sap bucket or decorative metal box, no less) with a bunch of pinecones and holly leaves from the nearest forest. Take a look at this original idea for candle holder Christmas decorations – it’s something beautiful that you can create in a simple and economical way. 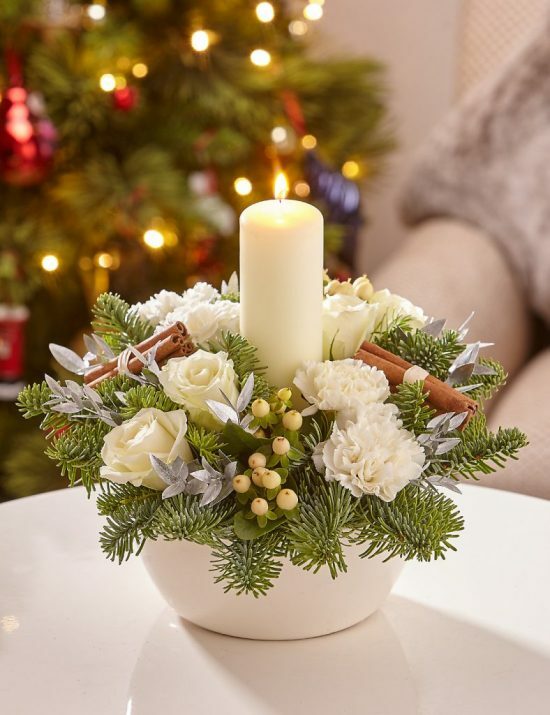 Crafted with detail in mind, this attractive arrangement is stunning as a joyful Christmas centerpiece for a large dining room table. All you need to do is to place a couple of taper candles in arrangement with some faux pine greenery, cinnamon sticks and seasonal fruits of your choice. 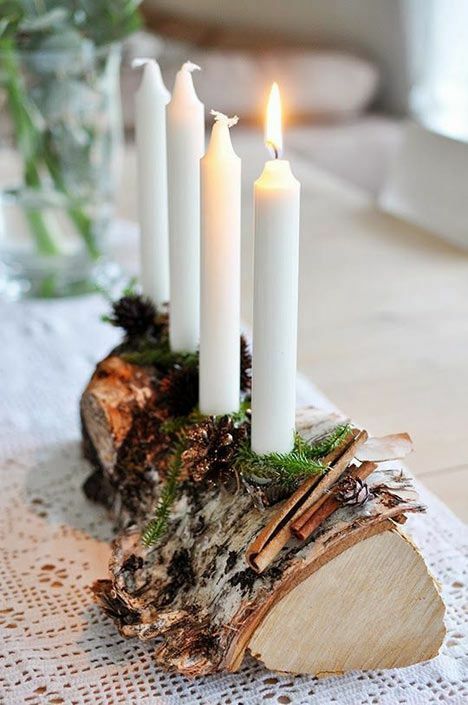 This unique DIY log tealight candle centerpiece is different from the rest of the Christmas candle holders decorations. It really pops on top of the festive dinner table. Add some fresh pine branches, pinecones, and a pocketful of red berries (faux is an option) for an additional charm. 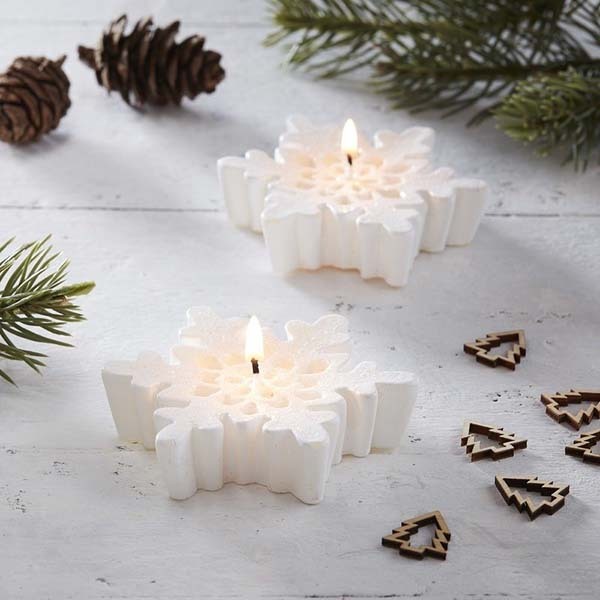 Decorate your holiday dining table in style this Christmas with this superb trio of white gleam snowflake candles in rustic style. 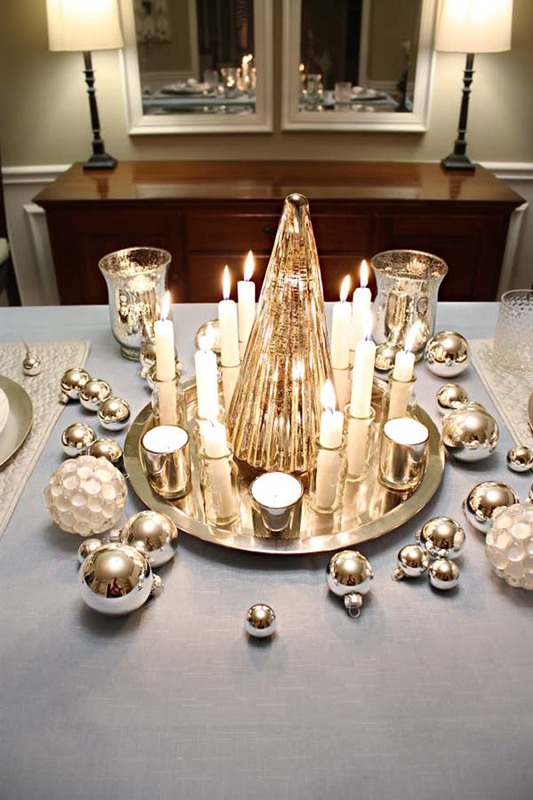 The unique design of these sophisticated candle Christmas table decorations surely makes a strong statement. In just a few minutes, you can build these charming luminaries using pickle jars (let’s say), red berries, cedar holly leaves or something green, and floating candles. This cute pearl garland adds an understated glamour to the simple tall glass candleholders. 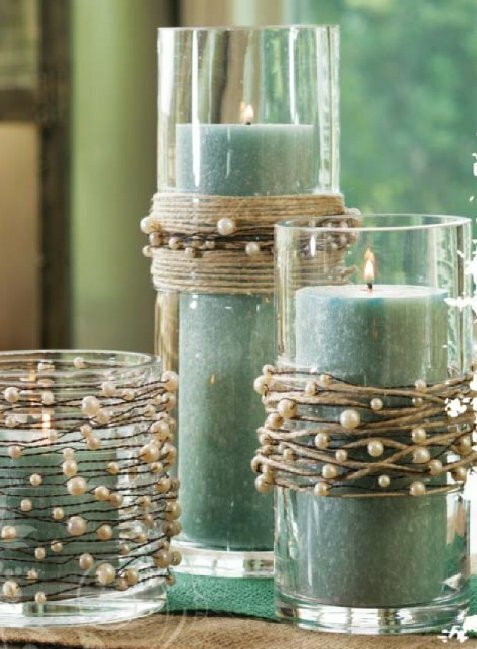 It would be also great wrapped around mason jars and wine glasses with tea tealights. Definitely one of my most favorite Christmas candle holders decorations! 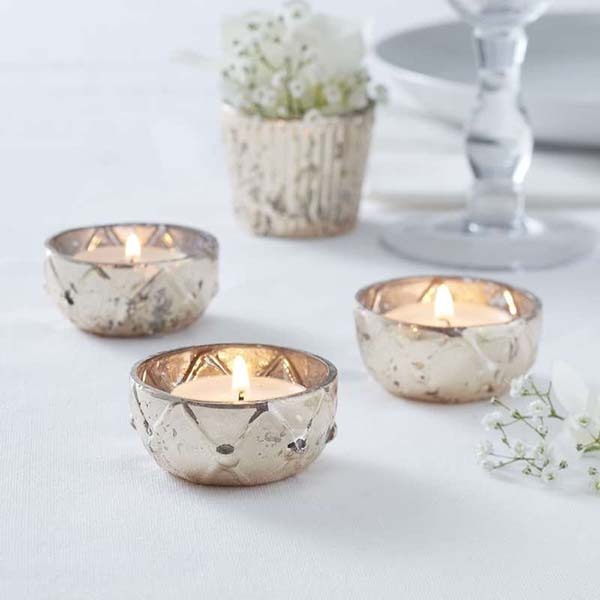 To accomplish the whimsical lighting for your special event, no matter if it’s Christmas or a wedding party, display a bunch of these cute tea light holders to get your glow. I’m in love with the rustic detail featuring a checked trim on the outside. 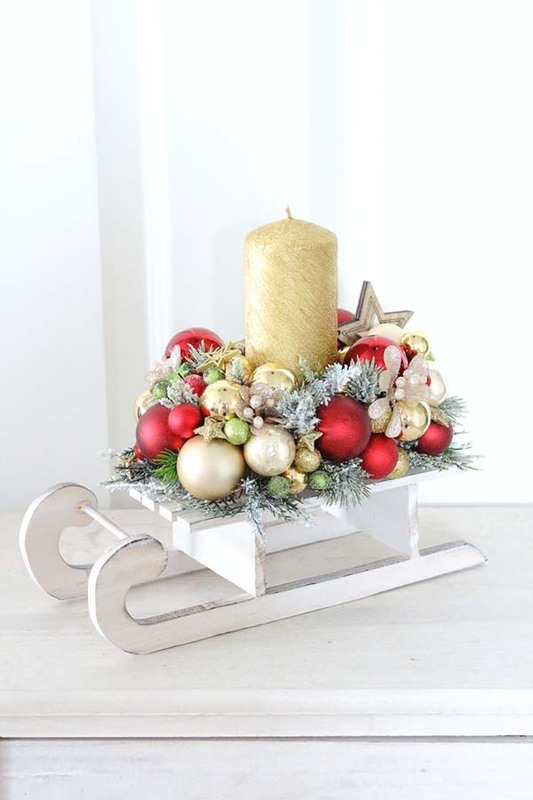 This eye-catching decorative Santa’s sleigh is filled with frosted evergreens, lots of large & small shimmering ornaments, and a golden pillar candle in the center. This is a great Christmas gift for a friend or someone from your family. 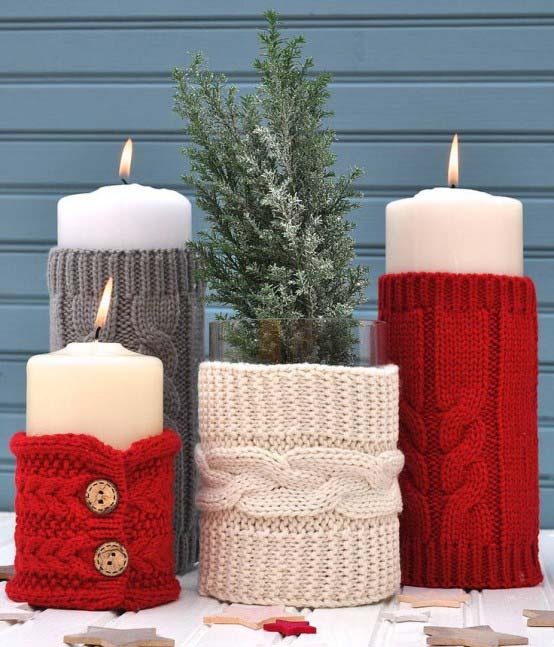 These different sized pillar candles dressed in knitted ‘clothes’ certainly look very chic. Keep in mind the knitted items always bring coziness and charm to any space, despite the season and the theme of the decoration. I’ll finish my collection with these Scandinavian style Christmas candle decorations that look both very simple and chic. The candleholder itself can be made from concrete. 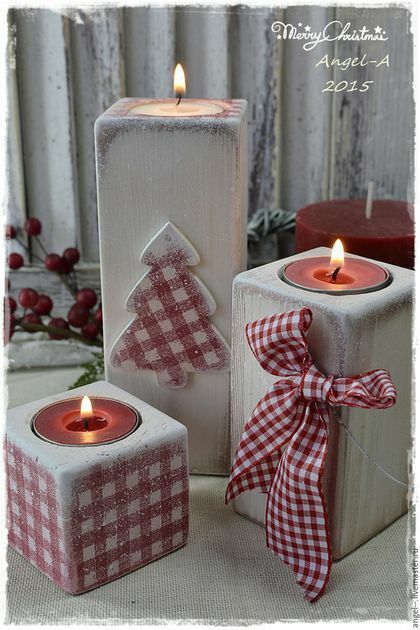 The ribbons and the other Christmassy elements give this setting very cheerful and warm vibe.